Updates to Patrick L.'s profile since your last visit are highlighted in yellow. I reported to the Naval Academy within two weeks of McBride graduation and served in Navy until 2002 as a Surface Warfare Officer on ships (frigates, destroyer, cruiser, oiler, command ships) and various staffs. Lived up and down both East and West Coast and Japan. I still return to St. Louis to visit my sister Anna. Remarried in 1996 to a Jersey girl, Sandra (Jean) Prus. We met on a blind date in Baltimore, MD in 1994. Upon my retirement from the Navy, Jean and I moved to the Eastern Panhandle of West Virginia and both worked in Washington DC, Northern VA area; she as a teacher and me in defense contracting. In 2014, we both retired from full time work and moved to Easton, PA to be closer to children, grandchildren and other family in NJ/NYC area. Favorite classes: Geometry, Biology, Physics, History, and French (thanks to Miss Berra). Elective club I wish I had joined: Debating would have come in handy spending so much time in Wash DC. Favorite sports: Soccer and Golf. I ran track but always pooped out at about 180 meters into the 220. Why I ran hurdles when they were taller than me I will never know. Unfortunately, reached my peak at golf while at McBride. I avoided getting stabbed or beaten up during lunch break outside in the park but I could not get out of the way of that one rock that sent me to the hospital to sew up my forehead. Loved those Freshman year varsity basketball games...the best. Remember carpooling to school with my brother Dennis, Mike Pendergast, Art Lampe, and sometimes Jimmy Schafers. Art's dad picked us up every morning...he was a great guy! Usually had to hitchhike home in evenings. Lesson learned, when you hitchhike, never jump out into the middle lane from in front of a bus without looking. Thankful that I was able to get into McBride in the first place, then get a great education from such a dedicated faculty, and still have fun with a tremendous group of guys. Patrick L. Denny updated profile. View. Patrick L. Denny has a birthday today. Patrick L. Denny added a photo to profile gallery. 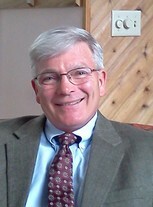 Patrick L. Denny changed "Now" picture.